Believe! You can paint this.. The Blue-and-Gold Macaw is symbolic of life in our tropical paradise. What a beautiful picture it is! The subtle shading contains the colors of the rainbow. You will be proud to display this one on your wall or gift it to a friend. Teacher Diane Davis is well trained in the use of both acrylics and oils and she will have you use both while painting this canvas. She has studied and received certification from a variety of professional teachers such as Bob Ross and Gary Jenkins. Come paint and learn with your old friends or make some new painting friends at this seminar that is suited to both beginning and intermediate painters. LOTS of paper towels! Before you come to class. Pile up your paper towels and cut them in half and then in half again. There is nothing like picking up a towel that has already been used. It saves on the use and keeps your hands fairly clean. Bring a small trash bag to tape to your table for the discarded towels. What a beautiful and tropical design to display on your wall. NOT an oil painter? You can learn so much by studying with those who teach other media from what you usually work with. 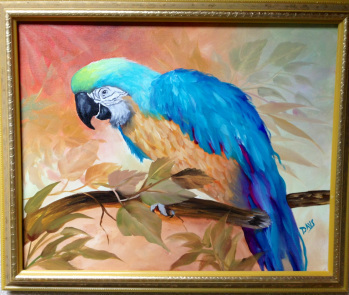 Diane Davis will bring both the beginner and the intermediate painter to successful results. Seminar sign-up is by mail (checks payable to DASF) Please include the seminar receipt you have filled in with your contact information. Note 1/2 down deposit required and the remainder 30 days prior. There is a "NO-refund" policy. Click Here for the registration form to enclose with your check made payable to "DASF"